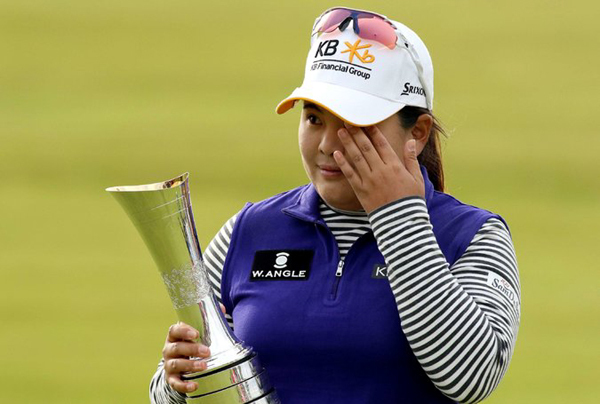 As Inbee Park hunted down Jin Young Ko in the final stretch of the Women’s British Open on Sunday, it quickly became clear which South Korean was the rookie and which was the player about to add another chapter in golf’s record book. The top-ranked Park picked up seven shots in her last 12 holes and completed a seven-under-par 65 in Turnberry, Scotland, to capture the trophy she thought she might never win. Park pressured Ko, her 20-year-old protégée, so much that she appeared to lose her nerve. Park won by three shots with a total of 12-under 276 for her seventh major title, becoming the seventh female player to capture four different majors. She joined Louise Suggs, Mickey Wright, Pat Bradley, Juli Inkster, Karrie Webb and Annika Sorenstam. “I don’t know what else to go for now,” said Park, who has won six of the last 14 majors to cement her status as the best female golfer of her generation. How about ending the debate about clinching the so-called career Grand Slam? The L.P.G.A. Tour is calling Park’s achievement just that. But Park has not won the Evian Championship in France since it was given the status of a fifth major in 2013. She won the Evian in 2012. The Evian is next month, when Park can definitively complete what some are calling the Super Slam. Ko was playing her first major and her first tournament outside Asia. She also played with a temporary local caddie giving her advice on every shot. She began the final round tied for the lead and pulled three shots clear of a bunched-up chasing pack after a 20-foot putt for birdie on No. 10. Ko had already eagled the par-5 seventh with a 25-foot putt and rolled in a birdie of similar length at No. 8. That was when Park made her move. She rolled in an eagle putt from 20 feet at No. 14 to close the gap to one shot, Ko missed a par putt on No. 13 soon after for her first bogey of the day, and Park holed a 4-footer for birdie at the 16th to take the lead for the first time in the tournament. No. 16 wound up being the deciding hole. Twenty minutes later, Ko’s chances of reclaiming the lead virtually ended on the par-4 16th when she pushed her approach shot into a burn. “I was a little overthinking, and then I was a little bit nervous,” Ko said. Park’s birdie putt on No. 18 lipped out, but it did not matter. She watched on a monitor in the scoring hut as Ko, playing two groups behind, failed to make birdie on No. 17, ensuring there would be no final-hole tension. Ko was bidding to become the third first-time major winner from South Korea in the last five majors, after Hyo-Joo Kim at the Evian last year and In-Gee Chun at the United States Women’s Open last month. Lydia Ko, 18, who was seeking to become the youngest major winner, shot a 69 and tied for third at eight under with So Yeon Ryu (68).